The early morning drive west begins from Calgary on the TransCanada Highway, then proceeds south on the Kananaskis Trail (Hwy. 40) past Wasootch, Mount Lorette Ponds, and the Fortress Junction Service Station to park roadside at Grizzly Creek. Helmets, harnesses, ice climbing boots and crampons are put on to begin the approach directly up frozen Grizzly Creek. Initial pitches are easy grades and as progress continues into the canyon the slopes increase in angle and length. Elevation is gained aggressively, one small ice waterfall at a time. 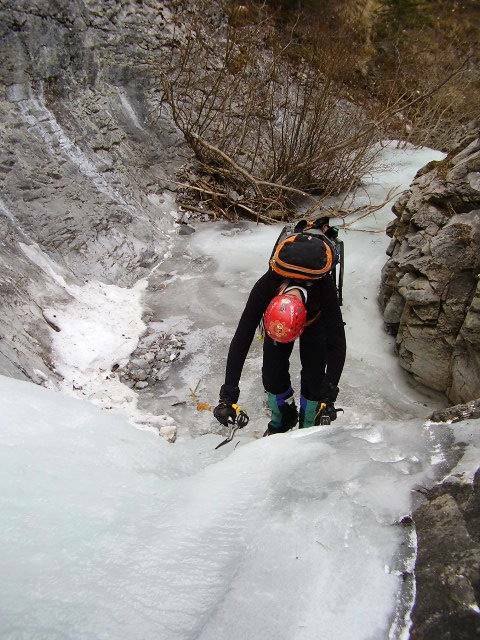 Moderate temperature allows the ice to take the axes and crampons without shattering or excessive penetration. The most experienced ice climber leads to set rope where a safety belay is required as Mélanie and I stage with bottom or top belay. The perfect day is clear and water can be heard running beneath stable ice. Following are a few photos for the day. To rappel off the top of the steep, long waterfall, Dave rigs an Abalokov Sandwich. This is a technique used for final descent, when there is no alternative but to anchor into ice and leave minimal trace. An ice screw, far too expensive to leave behind, is used to create a V-shaped channel into the ice. The screw is extracted. A small piece of 7 mm rope is inserted down into one channel and a sharp hook grabs the end at the bottom of the V so the rope can be pulled out the other side. The anchor rope is securely knotted into a small loop and the climbing rope is passed through this small loop, evened and thrown over the side to complete the rappel. At the bottom the climbing rope is pulled through leaving only the small loop in the ice which will wash away during Spring thaw and runoff. Ice conditions vary widely from one season to the next. Local ice climbers post current conditions online and these reports can be checked before commitment to a location. They provide a valuable service as well as a link for avalanche conditions which MUST be checked.